Cyber-Physical Attacks: A Growing Invisible Threat presents the growing list of harmful uses of computers and their ability to disable cameras, turn off a building’s lights, make a car veer off the road, or a drone land in enemy hands. 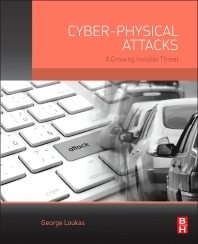 In essence, it details the ways cyber-physical attacks are replacing physical attacks in crime, warfare, and terrorism. The book explores how attacks using computers affect the physical world in ways that were previously only possible through physical means. Perpetrators can now cause damage without the same risk, and without the political, social, or moral outrage that would follow a more overt physical attack. Readers will learn about all aspects of this brave new world of cyber-physical attacks, along with tactics on how to defend against them. The book provides an accessible introduction to the variety of cyber-physical attacks that have already been employed or are likely to be employed in the near future. George Loukas is an associate professor of cyber security at University of Greenwich, London. He teaches and leads research projects in cyber-physical security, cyber-crime and digital communications, and has authored or co-authored 30 refereed journal articles, book chapters, and conference publications on cyber-physical security, cyber terrorism and related areas."